might be a good idea, the current mkiso name is IMHO too similar to good ol' mkisofs (that is generic and commandline). When/if you will have tested it succesfully with El-Torito floppy emulation and hard disk emulation, and of course all .iso levels, I will gladly remove the "mainly"
I haven't checked if newer builds take this into account. :unsure. Thanks for this helpful feedback as always. About the "PE" aspect, I am not sure actually : i believe that tool can be used for any purpose, not only Winpe projects. About the name, I must confess : i was pretty dry there. "mkiso" is derived from MakeIso, similar to the old good MakePE tool here on this forum. About the floppy/disk emlulation, mkiso (thru imapi2) can do it but I have hidden these features for now as I had no practical case to try out. Furthermore, I wanted to keep the interface as simple as possible (to start with ). I do my very best to keep things simple but my "strategy" for a while now is to work on one particular feature (pxe booting, disk imaging, ...) and stretch it over and over (clonedisk is one example). Thus, to keep each item easy to reach for end users, I also release tools individually : DiskMgr, VolumeMgr, MkIso, etc .. This way, the user has the ability to stay focused on one particular feature without having to discover a "big beast" like CloneDisk. About floppy/harddisk emulation, I have enabled a "hidden" (or not so obvious) feature in latest version. (see below). For now, I keep the GUI as simple as possible at first look (hence the hidden right click menu on the boot file selection button). Or may be I am not getting the "super" floppy concept. Will look deeper in the links you provided. EDIT : got it - 36Mb super floppy disks ... not on my todo list indeed - will stick to the 1.2/1.44/2.88/harddisk emulation types. Side note : when using efisys.bin (which happens to be a floppy), EmulationNone works fine. I am confused now : should not it be Emulation144MFloppy? The "normal" or "intended" behaviour of the El-Torito floppy emulation was that of floppy emulation (on BIOS). The result is similar to having a dual LUN device. The floppy disk is a "separate" device that gets its own drive letter and - for all the BIOS knows - is a (read only) bootable floppy drive. As a matter of fact it is the simplest possible booting method, the (emulated) floppy is mounted/accessed as "first floppy" (please read as (fd0) or drive #0 or A: if you prefer) and its bootsector is chainloaded by the BIOS just as if it was a "normal" floppy. For some time it was the only available method to boot CD's (I am talking here of DOS and NT 3.5/early 4.0 times) as many BIOSes were not compatible with the "no-emulation" mode that MS adopted for non-DOS botable CD's. In the good ol' times the NT 4.0 install CD was not even bootable and it came (from MS) with three floppies, you booted from the first floppy, read the other two and only then you would start accessing (hopefully) the CD. Moreover at the time the access to *any* device was - at least as BIOS level - in CHS (and not LBA) mode, so the geometry was important and BIOSes has already suitable CHS code for floppies formats. the good guys at MenuetOS took this concept a step further, putting together the simpler possible way to create a bootabloe .iso, that is ONLY a bootable emulated floppy (with no CDFS or UDF filesystem attached). The efisys.bin, that the good MS guys arbitrarily decided to make with the same size as a floppy disk is instead intended for UEFI/EFI only, and it behaves as a "searchable filesystem", there is no reason why it should be this or that size or have this or that geometry. The UEFI "sees" a filesystem and looks in it for either BOOTX64.EFI or a BOOTIA32.EFI (hardcoded names for UEFI bootfiles). About superfloppies, it will cost you nothing to add them. the issue is that most iso making tools (where the programmers have been either as royalist as or more royalist than the king) do check the actual size of the file provided for "floppy emulation" and, if it doesn't correspond to the "standard" size, throws an error. So, if your tool allows *any* size of the file for "Bootfile", it already works just fine for superfloppies, if there is a check for sizes, then either removing it altogether or offering an option to remove it would be enough. If you prefer, a UEFI machine with CSM (please read BIOS) enabled should boot out of that file even if the contents are X64 (or whatever). I have renamed MkIso to MakeIso to avoid confusion with mkisofs. 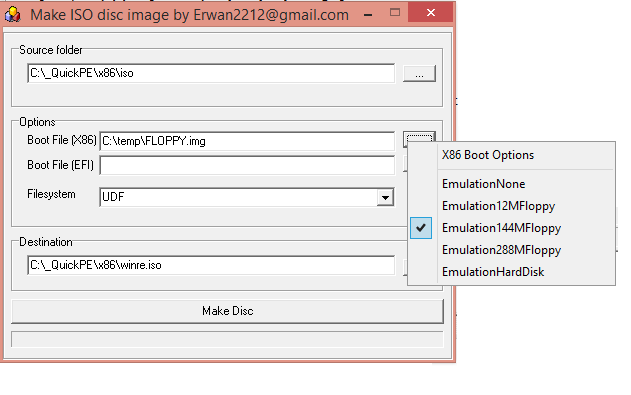 I checked imapi2 and super floppies : in Emulation288MFloppy mode, it wont accept images bigger than 2949120 bytes. There may be a way around this limitation, I might look into it later on. About "Boot File (X86)", I am merely reusing MS wording (here) but indeed, "Boot File (BIOS)" would be more suited. @Wonko,@CDOB: any el torrito parser you could recommend? I will look at el torrito specs but having a tool parse an iso header would help better understand an iso and possibly come with a few extra features, workarounds, etc. Doing random test I got a "ole error c0aab132"? Data file is too large for '%1!ls!' file system. ISO9660+UDF and a 3,8 GB install.wim. Works fine at UDF only, that's good. Default setting was UDF only, I changed it to ISO9660+UDF. My fault. Can you add more help texts like "IMAPI_E_DATA_TOO_BIG"? Or a link to the "IMAPI Return Values"? There is a file 'BOOTMGR.' Recognice the leading dot. ISO9660 Level 1 requires a leading dot. IsoBuster free shows names and el torrito. In doubt, use a HexEditor. Nothing really like a useful "detailed" parser that I know of . Isoinfo (part of cdrecord/cdrtools) does provide some, but only little, info. it is Commercial, but the free/trial version is enough to quickly check a .iso structure. is more file oriented than "iso structure" oriented. any el torrito parser you could recommend? A_ At least part of the information of an ISO image, including at least some of the El Torrito info, could be obtained by "isoinfo(.exe)", part of cdrtools. Data preparer id: XORRISO-1.4.6 2016.09.16.133001, LIBISOBURN-1.4.6, LIBISOFS-1. Please note that the above last item, "Eltorito defaultboot header" shows the _default_ header only; I happen to know that the same ISO image also includes at least 1 additional header (for EFI boot). Additional or different information might be obtained perhaps by combining other isoinfo command line options. "xorriso.exe" is not so easy to obtain (the last version I know of is v. 1.3.4, originally released during December 2013; most modern Linux distributions would provide a newer version, usually with improvements). BTW, if the last boot entry is pointing to a EFI System Partition (ESP), then size "zero" (0) means "up to the end of the ISO". UEFI specs prescribe this if the ESP (e.g. superfloppy) image is larger than 32 MiB. Thanks for this useful feedback. Will interpret the imapi error codes. About iso9660, the max supported is iso level 2. Not sure how I can work around that (patching the iso afterwards is an option?). As a whole, support around iso9660 in imapi2 seems limited. Still looking to improve or correct some issue with MakeIso, I could not get the iso details (my volume descriptor, my boot record, my boot catalog, ...) i was looking for using isoinfo.exe found in cdrtools. I read thru the specifications posted above and quickly came with the attached command line tool. Running iso_info.exe c:\temp\winre.iso will give the below output. Then, one can easily dump a cd boot file by running dsfo winre.iso 45056 1474560 boot.bin. Well, though I am one of the major supporters of the DSFOK toolkit , maybe it would be easier to just use 7-zip for that. which covers the cases where the sector numbers for the (no-emulation) bootsector are "faked". About the sector count, I had already noticed it was not to be trusted for floppy images. My iso_info takes care of that on the fly. I have not yet looked closely at the HD emulation. About isolinux, this is indeed a special case I know of. sector count is (most of the times?) 4 - the slitaz 3.0 image generated by genisoimage is a good example. I have not yet gone thru your batch (the one posted in this thread) but my idea was to use the boot table (offset 16 = boot file length). May be this is what your are doing already? Although a quick look at your batch seems to indicate you are using the iso directory listing. Still about isolinux and the boot table, I am using another (exotic?) approach : i am writing the whole isolinux.bin as a boot file with sector count = whole file size and only take care of the checksum in the boot table (ignoring all other fields). Uploading a new version of iso_info which will also eventually display the boot table (i.e if a valid one found) included in the boot file. If exist a boot table, then the boot file length should be taken from there and not from the sector count found in the boot catalog. I am slightly deviating thus from the main thread which is about MakeIso, i.e making the process as quick and easy as possible to make a (multi) bootable iso. Ok, thought so : CDOB approach and your batch are indeed based on the file size in the directlory listing. About "boot table" and "offset 16", I see we have a difference of opinion there : double checking however, seems to indicate that this field is to be trusted. Check my previous post and the new version of iso_info displaying the boot table. With this approach, you also dont need to know the boot file name (to search it from the directory listing). Last but not least, it seems isoinfo (from cdrtools) is ignoring the second boot entry. About -boot-load-size 4, get it now. I have tested a few machines and I was lucky enough to have a "tolerant" bios who was ok with a sector count>4. Thus, to stick to specs, I should review my (exotic) approach when handling isolinux (and possibly other boot loader requiring the boot table). Side note : grldr is handled fine by MakeIso and I am currently looking at grub2 now. Note for later (and really no big deal since it boots fine in both modes) : although I instruct IMAPI to use no emulation mode for both my boot files, somewhere in the process, the emulation type for EFI is switched to media type=2 (when I would expect it to be 0). The issue remains about what happens if you have -boot-load-size 4 WITHOUT -boot-info-table (i.e. if the boot-info-table is created or not). In a nutshell, Isolinux pre-populates it, whilst grub4dos doesn't (and you will never know what a "random" non-2048 bytes bootloader may do, nor whether the people creating the .iso will have used this or that option). The boot table does not seem so reliable indeed : defining if there is one is one first tricky part, then ensuring values in there are to be trusted is another tricky part. And now I read that grub4dos also has a boot table (???) but as it is prepopulated most of us (using mkisofs) ignore it? Playing with iso images is "fun" for sure! I'll stop there with my "cheap" iso_info command line tool : objective was for me to get the informations (offset, size, etc) from various headers contained in an iso to develop further MakeIso and deliver proper (or as proper as possible...) ISO's. It is fair enough , after all the boot-info-table is itself a kind of "hack", and this is the reason why it should not be used as a "simple" way for getting the boot file size.